When you’re drawing graphics in your app, something that’s really important to make them look good is to pixel align them. This is the process of making sure all of the boundaries for a shape line up exactly with the screen’s pixel grid. Now the coordinates are back to integer values again. Luckily, this is pretty easy to generalize: odd stroke sizes should be rounded to integer and a half pixel values and even stroke sizes (including a fill, which is a zero size stroke) should be rounded to integer pixel values. What about decimal stroke values that are neither even or odd? Well there’s not much you can do to pixel align in that case since the stroke itself being a non-integer pixel size is already un-pixel-align-able. 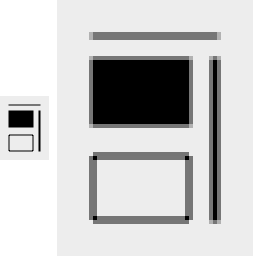 If you’re using any additional geometry transforms (like NSAffineTransform) while drawing, you’ll have to take those into account when pixel aligning. For scaling and translating, you should transform the coordinates, then pixel align them, then un-transform the results. For rotations and shears, you’re usually better off just not pixel aligning, since there’s no way to make your transformed graphics line up with the pixel grid. This entry was posted on Thursday, October 22nd, 2009.